A permit is required prior to performing any street tree pruning work. Street trees are trees in the public right-of-way, typically between the curb and sidewalk. The permit is available online at no fee from the Permit Center. You may also call the Permit Center at (253) 591-5030 or send them an email. Only an owner of the property abutting the street tree, or the owner's designee, may apply for a street tree pruning permit. Information about tree removals can be found here. The City of Tacoma requires abutting property owners to maintain adjoining rights-of-way in a manner that is safe for the public. The City of Tacoma requires maintaining clearance standards 8 feet above the full width of sidewalk and 14 feet above the full width of streets and alleys. The City of Tacoma, in general, does not maintain trees in the rights-of-way that are not abutting City-owned private property (this includes pruning and removal); exceptions may occasionally be made due to easement stipulations, construction, abatement and other similar reasons. This section is only for trees growing in yards on private property, not in the public right-of-way. The City of Tacoma generally has no tree cutting ordinance that regulates the cutting of trees on private properties (pruning or removal). You may need a permit if your property is located in or near critical areas as defined by Tacoma Municipal Code 13.11. Critical areas include critical aquifer recharge areas, fish and wildlife habitat conservation areas (FWHCAs), flood hazard areas, geologically hazardous areas, stream corridors, and wetlands. Please call the Permit Counter at (253) 591-5030 and a Permit Specialist will review your property status to determine if a permit is needed. If a permit is needed, an application will be sent to you. The City of Tacoma does not offer consulting services for trees located on private property. For private property tree consultations, consider hiring a Consulting Arborist. For more information about what a Consulting Arborist is, when to hire and how to find one, please visit the International Society of Arboriculture "Find an Arborist" webpage. The City of Tacoma does not prune or remove trees to preserve views for public or private benefit. If you wish to apply for a permit for any pruning or removal to be completed on a tree within a right-of-way or located on City-owned parcels, you may do so here. Should the permit be granted, all conditions of the permit must be met and are subject to Tacoma Municipal Code 13.11. Any costs associated with the pruning or removal of a tree located in a right-of-way or on City-owned parcels for the purpose of view enhancement will be the responsibility of the person applying and may include costs associated with the labor and services of a bonded and certified arborist. Pruning or removal that does not meet the standards of the permit may be treated as a code violation and be subject to civil and criminal penalties and tree replacement. Topping will not be permitted. The permit application has a minimum fee of $1,300 at the time of application for review. These funds pay for staff time to review the application. Any unused funds will be returned to the applicant, per Tacoma Municipal Code 9.20. All of the permit application must be complete at the time of submission. This includes a plan clearly indicating which trees are requested to be pruned or removed and what the desired course of action is. See the application for more detailed information. 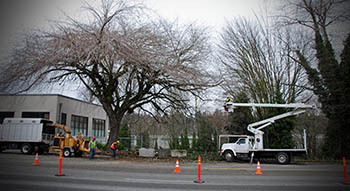 Pruning or removing trees within a critical area or buffer, as defined by Tacoma Municipal Code 13.11, may be subject to requirements in Tacoma Municipal Code 13.11. Generally, replanting may be a condition of the permit if the applicant is proposing removal. Topping is not a pruning standard, nor is it permitted. Select crown reduction, crown raising or thinning by a licensed, bonded and certified arborist are the only pruning methods accepted. Structural pruning is the pruning of young trees to develop good structure, including a strong and well established central leader, strong branch attachments, and adequate spacing and distribution of scaffold branches. Young tree pruning occurs on an ongoing basis the first ten years after tree planting. Crown cleaning is the removal of water sprouts and dead, dying, diseased, crowded, weakly attached and low vigor branches from a tree's crown. Crown raising for clearance of the street and sidewalk removes the lower branches of a tree in order to provide clearance for vehicles, pedestrians, and buildings. The City of Tacoma requires maintaining clearance standards 8 feet above the full width of sidewalk and 14 feet above the full width of streets and alleys. For questions about permits, please contact the Permit Center at (253) 591-5030 or email. For questions about trees, pruning or free assessments for right-of-way trees, please call 311. All pruning work must meet Tacoma's Street Tree Pruning Standards. Pruning done without a permit or pruning that does not meet the standards may be treated as a code violation and be subject to civil and criminal penalties and tree replacement. Topping will not be permitted. In order to limit the spread of Dutch elm disease and comply with the quarantine of elm wood, the following rules apply to the pruning of elm trees (Ulmus spp. ): Elm trees shall not be pruned from April 15 through October 15 annually. Pruning tools shall be treated with a disinfectant before and after pruning individual elm trees. Within 24 hours of cutting, all wood waste shall be chipped or taken to an approved commercial disposal site, such as the Tacoma Recovery & Transfer Center (formerly Tacoma Landfill) at 3510 South Mullen Street.